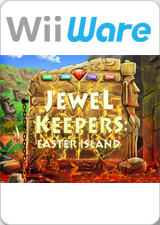 In Jewel Keepers: Easter Island, help Professor "H" solve puzzles and quests to reveal the big secret of Easter Island! One day Professor “H”, the world-renowned expert on Easter Island, received a strange letter from the capital city Hanga Roa. It was a cry for help from somebody unknown. It said that something bad was going on the island. Without any hesitation, the Professor, together with his assistant Joel and his granddaughter Ivie, rushed to the island, where many puzzles, mysteries and quests awaited them. Can you help him to reveal the greatest secret of Easter Island? The graph below charts the compatibility with Jewel Keepers: Easter Island since Dolphin's 2.0 release, listing revisions only where a compatibility change occurred. This page was last edited on 15 January 2018, at 04:43.